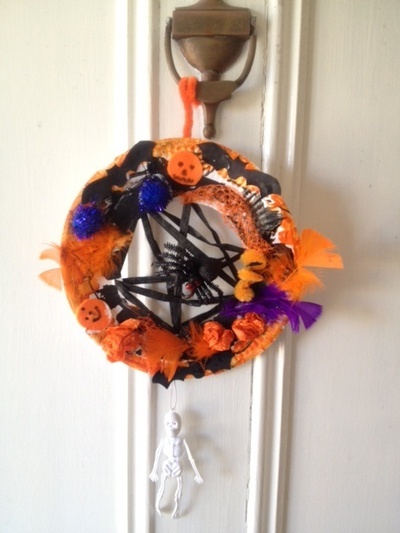 Have fun creating this wreath decoration to brighten up your door at Halloween. Cut a hole in the centre of the paper plate to make a ring. Punch holes around the inner edge of the ring with a hole punch. Lace the raffia (or wool, string etc) in and out of the holes across the plate to make a web effect. Stick the two loose ends to the back of the ring. 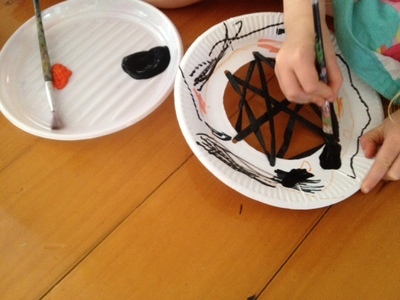 Decorate the ring with orange and black crayons, pens and paint. Try to cover up as much of the white background as possible. 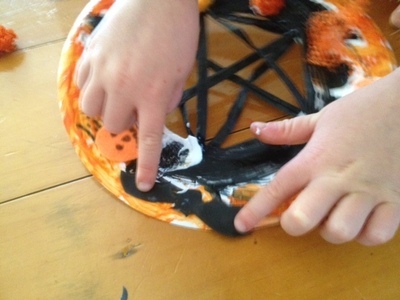 Glue the orange, black and purple decorations onto the painted ring. We cut some bat shapes out of black paper and some orange pumpkins out of orange felt scraps and drew faces on. Tape a hanger to the back. We used an orange pipe cleaner which could easily be tied to the door knocker. Add any plastic Halloween novelties. We added a plastic spider to the web part and hung a skeleton from the bottom of the wreath. 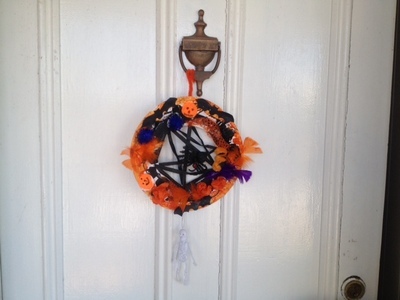 Your Halloween wreath door decoration is now ready to hang.